To understand how Google search works, we need to explore the history of the Google Search Engine. To do that we start at the beginning of search and continue through Google’s storied existence. 1990– The first search engine is Archie. A year after they invented the world wide web (WWW), the early search engine crawled through an index of downloadable files. However, the limited data made only the listings available, not the content. 1991– Tim Berners-Lee, the inventor of the WWW, created a virtual library to help users find URLs for different websites. The CERN webservers hosted the library at the beginning of the internet. 1993– JumpStation brought a new leap with their linear search which showed a page’s title and header in the same results. The search engine ranks results in the order they were found. 1994– David Filo and Jerry Yang create Yahoo! Search. The site was the first collection of web pages across the internet. They include man-made descriptions for the URLs. Site owners can add Informational sites for free, but commercial sites had to pay $300/year. WebCrawler– the same year that Yahoo! Search launched, saw the launch of Web Crawler. They create the first search engine to index entire pages. The amount of data required to do the search engine too slow to use during the day. 1995– Lycos search engine also launched in 1994. The search engine cataloged over 394,000 documents by August. By January 1995, they had over 1.5 million documents cataloged. 1996- Larry Page and Sergey Brin created the predecessor to Google BackRub. The initial idea used backlinks to help rank websites for better search. The backlinks show you how one website that links to another site counts as a vote. This idea is the basis of a website’s authority. Today’s algorithm still relies on the same initial concept. It has advanced tremendously in the past 20 years, but backlinking still plays a part in the ranking. AskJeeves– The first search engine where they attempt to have human editors respond to search queries. The site became easy prey to spam. Inktomi– A pioneer in the paid advertising model. Inktomi provided an early precursor to pay-per-click (PPC) ads. Lycos– Still the largest search engine. Lycos now has over 60 million documents indexed. Overture (formerly Goto.com)– The company was the first to use a PPC model successfully. 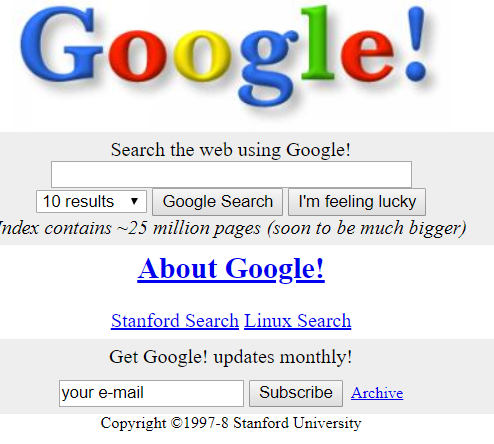 1999– Sequoia Capital and others invest in Google. Also, AOL selects Google as a search partner. 2001- The search engine Excite goes bankrupt and is bought by for $10 million. AskJeeves– The search engine buys Teoma to replace their Direct search engine. 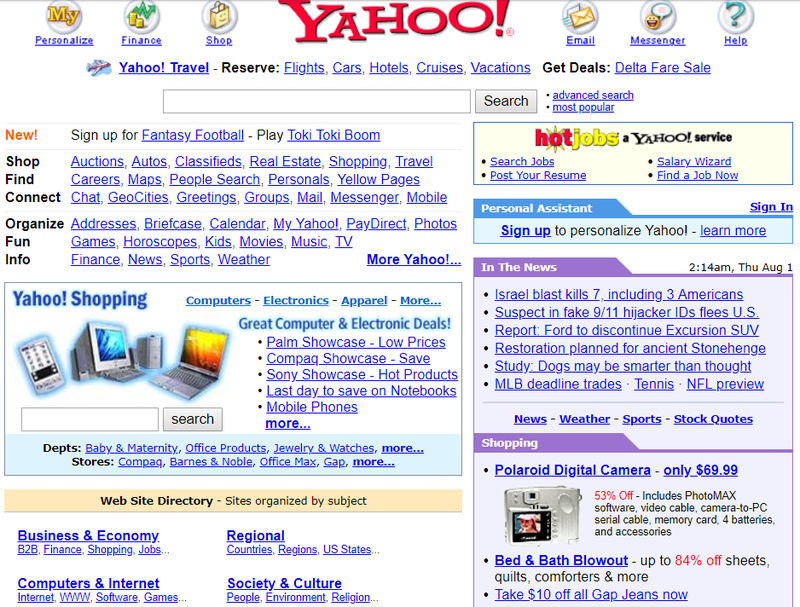 2002- Yahoo! acquires other search engines to find search results for customers organically. Previously, they outsourced the service to third-party vendors. 2003- Overture bought by AllTheWeb for $70 million and Inktomi bought by Yahoo! for $235 million. Yahoo! then buys Overture for $1.63 billion. Google– They announce the first search algorithm update at Northeastern’s SES Boston, which is why it is called the “Boston” update. 2004- Microsoft launches their new MSN search engine. 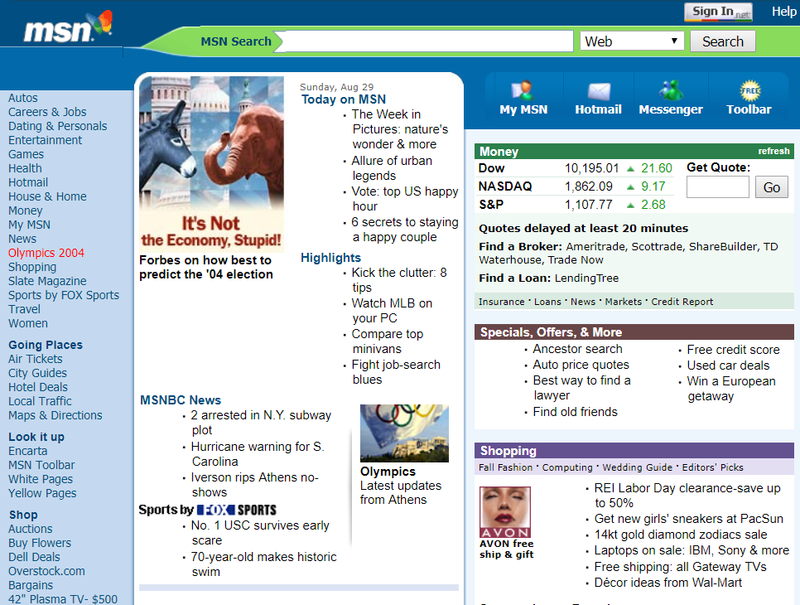 2005- Microsoft’s MSN search engine starts to use its in-house technology in favor of Yahoo! results. Ask– IAC (Ticketmaster.com and Match.com) buy Ask Jeeves for $1.85 Billion. They change the name to Ask.com and drop the Teoma search platform. Nofollow– The major search engines use the “nofollow” tag to clean up spammy blogs. 2007- Google created “Universal Search.” Instead of the traditional 10-listings, they added features for News, Video, Images, Local, and other verticals. 2008- “Google Suggest” launch provides dropdowns of suggested topics. 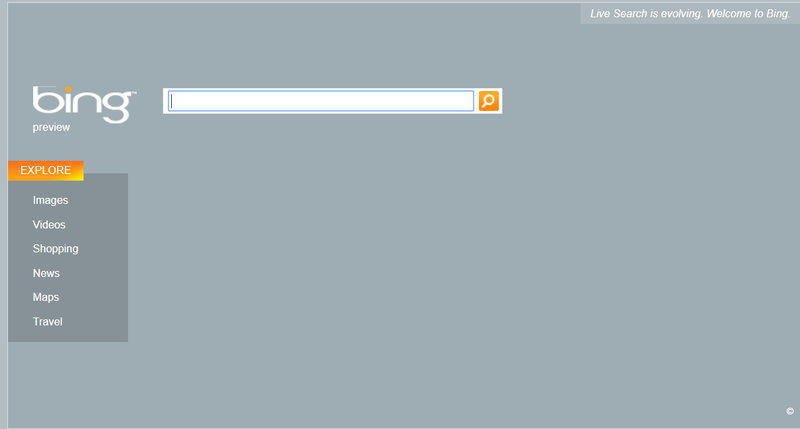 2009- MSN/Live Search becomes Bing. 2010- Google improved their web indexing system to enhance fresh search results by 50%. They call the update Caffeine. Google Instant shows real-time search results for users as they enter a query. 2011- To create a more structured internet, Google, Yahoo!, and Microsoft (Bing) create Schema.org. Google– The search engine launches the first significant algorithm change to improve query results. The Google Panda algorithm reduces the effectiveness of content farms and scraper sites. The change affects 12% of all US search results. 2012- Following the Panda release, Google launched the Google Penguin algorithm update. This update penalizes sites buying links or using link networks to boost their search rankings. 2013- Google revolutionizes their search algorithm again with their Hummingbird update. The algorithm is the first attempt by a search engine to understand the human intent behind a search query. The history of search until then focused on how to improve language queries. 2014- Yahoo! becomes the default search engine for Mozilla Firefox in the US. Google– The Pigeon algorithm updates the search engines local search results. They want to provide accurate, relevant local search results for users. Google– discusses how website security is now a ranking factor with their HTTPS Everywhere campaign. 2015- Google unleashes Mobilegeddon to force websites to add mobile-friendly websites. The change acknowledges the rapid rise in mobile search use. 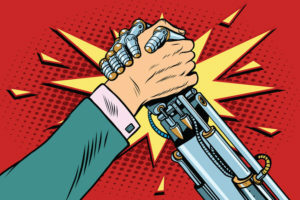 Furthermore, Google releases RankBrain, a machine learning program that automates the ranking algorithm. Bing– Copying Google, they add a mobile-friendly algorithm. 2016- Google Possum attacks local spam sites just like the “nofollow” tag a decade earlier removed spammy websites. 2017- Google penalized sites using interstitial and pop-up ads that destroy the mobile experience. Additionally, Google’s “Fred” update penalizes sites with low-quality backlinks as well as those who value money over user experience. The history of search is fascinating because initially, no one would have suspected an upstart like Google would dominate search engines the way they have over the past few years. However, looking back they were the ones who first started to understand what customers wanted. By looking at this history, as search engine marketers we can understand how to improve our rankings and stay current with Google’s upcoming requirements. For this Detailed information How Search engines transformed to most advanced one which we are using today. Thanks for such useful post. Nowadays how the search engine increases the crawling and traffic?